Indonesia is an archipelago nation of true natural beauty where tourists are genuinely welcomed with open arms and open hearts. There is an aura about Indonesia that charms every soul. Freedom is easy to feel in these islands where the sun warms the skin, the wind tosses the hair, and the aroma of wistful incense trickles up the clear night sky. This is what Indonesia is all about: an endless timeless beauty that stretches across a panoramic horizon of misty volcanoes, jungle slopes, and crashing waves. When visitors arrive in Indonesia, they are typically amazed by the sheer energy and chaos of Indonesian life. Mopeds zip across roads between crowded buses and cows, and alongside horse-drawn carts. Farmers in the countryside sweat profusely while working rice paddies that beam various shades of color. The cities, meanwhile, are infested with towering skyscrapers, four-lane highways, intermittent traffic surges, neon signs splashed over buildings, rough sidewalks, and an endless bazaar of bright shops. During the day, culture is seen everywhere in the open-air markets, tombs and temples, museums and monuments, and gardens tucked away in the hills of island towns. Nighttime brings no respite, as the streets are suddenly transformed into lines of stands frying rice and grilling satay skewered meats – the aroma of which filters through to the party-goers stepping out of the lively discos and after-hour bars. Geographically, Indonesia is an archipelago of more than 13,500 islands and tiny islets! More than 6,000 of these are inhabited. The islands actually bridge the Pacific and Indian Oceans and span a distance greater than that between the east and west coasts of the United States. Mountains and volcanoes dominate the islands. The highest mountains are permanently capped with snow and found on Irian Jaya, which is the Indonesian half of the island of New Guinea. The most famous of Indonesia’s volcanoes is Krakatau (or Krakatoa), which erupted in 1883 in one of the worst volcanic disasters ever recorded. Besides volcanic ranges, Indonesia is also blessed with pristine beaches, lush rainforests, rolling green hills, exotic spices and flowers, rich ocean marine life, and rare jungle wildlife, including the celebrated Komodo dragon. With such rich beauty and culture, this fifth most populous nation should never have a problem attracting tourists. And this seems to be true; even with perennial government corruption, threats from militant Islamic forces, inter-fighting among religious and ethnic groups from the various islands, terrorist suicide bombings like the 2005 Bali incident, and devastating natural catastrophes such as the 2004 tsunami, Indonesia always bounces back into the hearts and minds of travelers. In Indonesia, resort beaches where visitors can relax and enjoy recreational water sports represent the main draw of tourists for the country. Bali, Lombok, Sumatra, Flores, Java, Sumbawa, and Sumba are all packed with resorts and hotels overlooking beaches and coral reef oceans. Surfing is one of the most popular endeavors, with famous surfing beaches like the Ulu Watu on Bali. Indonesia also has 15% of the world’s coral reefs, giving the islands some of the best dive spots in the world. 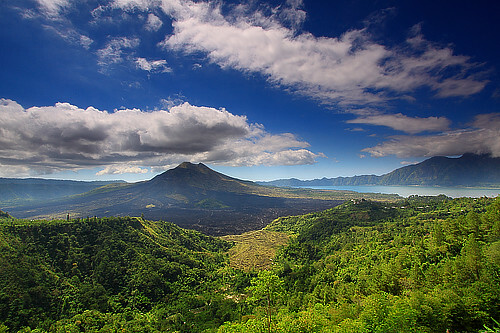 Trekking the interior volcanoes, mountains, caves, rainforests, and rivers is Indonesia’s other major draw. On Java Island, the hike up the highest and most famous volcano in Indonesia, Krakatau (or Krakatoa) is a “must”. This is the volcano that erupted notoriously in 1883, killing thousands. Surprisingly, though, the volcanic Mount Bromo is actually more visited. Other hike-able volcanoes include Kawah Ijen on Java, Gunung Agung in Bali, Keli Mutu, Gunung Rinjani, and Nusa Tenggara Barat on Lombok. The Gunung Agung in Bali is part of a chain of volcanic mountains and has conical peaks that rise as high as 10,400 feet. The jungles and rainforests of Indonesia are a thrill to explore. Sumatra, Irian Jaya, and Kalimantan, in particular, offer pristine and remote terrains. The best trails are found in the Muller Mountain of Kalimantan and Bukit Barisan National Park, which sits remotely in Sumatra on a beautiful peninsula. Another natural thrill is touring the great Mahakam River in Kalimantan on the island of Borneo. This river runs from the coast to the mountainous interiors and traverses through jungles and traditional tribal communities. Caving can be done on Java. Notable caves include Luweng Jaran of the Gunung Seuw mountain range, Gombong with its 130-feet plus stone towers, and Gua Barat, which has the longest underground river in the southern hemisphere. Sulawesi is known as “Orchid Island” and features mountains, lakes, and misty valleys. Eco-tours are available, which even take visitors to the nearby Tukangbeshi archipelago where they can help preserve the coral reefs there by collecting scientific data. Sulawesi, as beautiful as it is, attracts tourists more so for its famous Bantimurung Nature Reserve in the south, which is home to thousands of exotic butterflies. The island also has numerous hot springs and geysers at Makule, Karumengan, Leilem, Lahendong, and Kinilow. For another hot spring destination, visit the Holy Springs of Tampaksiring on Bali, a popular health destination for the ill. Numerous temples and mosques of religious significance are found in Indonesia. The Sea Temple of Tanah Lot on the west coast is perhaps the most breathtaking of Bali’s myriad sights. The Pura Besakih is another notable temple on Bali; it was built in the 10th century on the volcanic slopes of Gunung Anung and is a massive complex of over 30 temples. The Prambanan temple complex on Java honors the Hindu gods of Vishnu, Shiva, and Brahma, while Borobudur is the largest Buddhist sanctuary in the world; it features over three miles worth of relief carvings. Also on Java, you’ll find the Istiqlal Mosque in Jakarta; it is the world’s largest mosque. On Sulawesi, visit the “Land of the Heavenly Kings” in Torajaland, where you’ll find richly ornamented houses and vertical cliffside tombs where the dead are customarily buried. Indonesia is located near the equator, giving the country a tropical climate. Temperatures are generally high. The weather along the coasts and lowland plains are very warm and humid, averaging temperatures of around 28ºC. The mountainous areas are a little cooler, averaging around 23ºC. Monsoons hit the islands in the south and east during the summer months, while the northwest gets hit during the winter months. On most of the islands, rainfall is plentiful, resulting in lush forests and greenery year-round. However, the smaller islands in the southeast experience long and severe dry seasons, making those lands suitable only for grazing and growing crops that do not require much moisture. McVey, Ruth, and Richard Butwell. “Indonesia.” Lands and Peoples, Volume 2. Danbury: Grolier Incorporated, 2001. ISBN: 0717280225. Smith, Holly, Emma Tan, and Bina Maniar. Indonesia. New York: Prentice Hall Travel, 1993. ISBN: 0671879057.